Hello all. 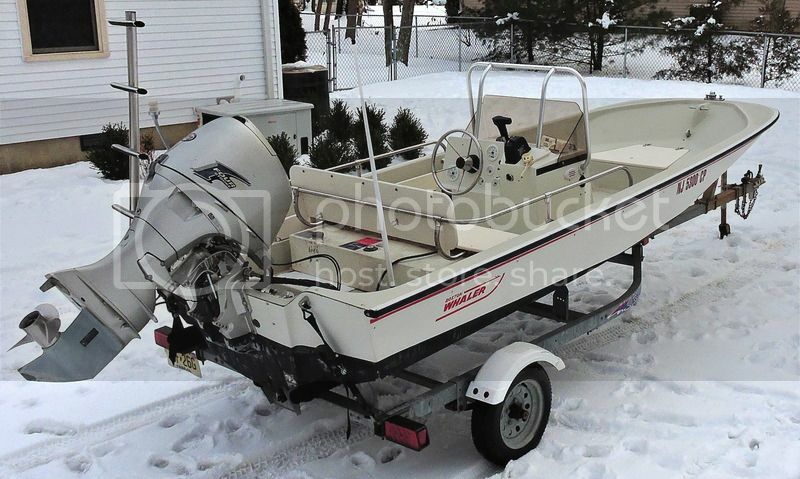 I have an 1989 Boston Whaler Montauk 17 that I bought four years ago. I have been putting work into it each year, and I am excited to work on it again this summer. I am also a bit of a novice when it comes to working with the boat. I would like to put a [fixed-mount] VHF radio on [this 17-foot center console boat] this year. I have been contemplating a handheld due to price. I run the boat mostly in Barnegat Bay, so I do not need a powerful radio, but I do like the idea of having a [fixed-mount] radio. With that being said, I am attempting to price out how much an entry-level mountable vhf radio will cost with all necessary kit. I understand there are a few mounting locations and options for the antenna, and I thank the forum for all of the knowledge that has been shared to date. ANTENNA LOCATION OPTION ONE: mount [antenna] to the console. This would involve a ratchet rail mount--yes?--and a [shorter 4-foot-long] antenna. I like this option as it will allow for easy routing [of the transmission line from] the radio [to the antenna]. I will have a console cover made this year, which will affect the antenna. I see that as the biggest obstacle to the console mounted option. Please let me know know if anyone has a good work-around for the console cover problem. I saw someone in an older forum mentioned a detachable bracket, but I am unsure what this is and how it will work. Any insight is appreciated. ANTENNA LOCATION OPTION TWO: mount [antenna] near the stern. This option would also involve a ratchet rail mount, but a larger, 8-foot-long antenna. I would then have to run the cable from the stern up the tunnel to the radio. Again, I am looking for a cost-effective way to complete this task. I looked on West Marine, and surprise they are very expensive. I started looking around Amazon for some other options. I understand that this antenna is for a sail boat, but I am wondering if I can use it for my purposes and with a rail mount. If not, is there a specific type of antenna that I should be looking for to have the rail mount work? The easiest way to sort all of this out would be to walk into my local marine shop and ask somewhere there, but I am overseas until June. I would like to figure out the best option and know the equipment that I need to make this happen so I can get after the day after landing in Newark! Thanks again for all of the sharing and knowledge that this web page provides. And it is my hope to get out to the Hudson/NYC Whaler meet up this June. Ten years of boating in the off season by myself in Maine has taught me that you should never skimp on safety equipment. If money is tight, invest in a good waterproof hand held VHF. Acknowledge that you will need to wear it on your person every time you are on the boat. Just like your life jacket. 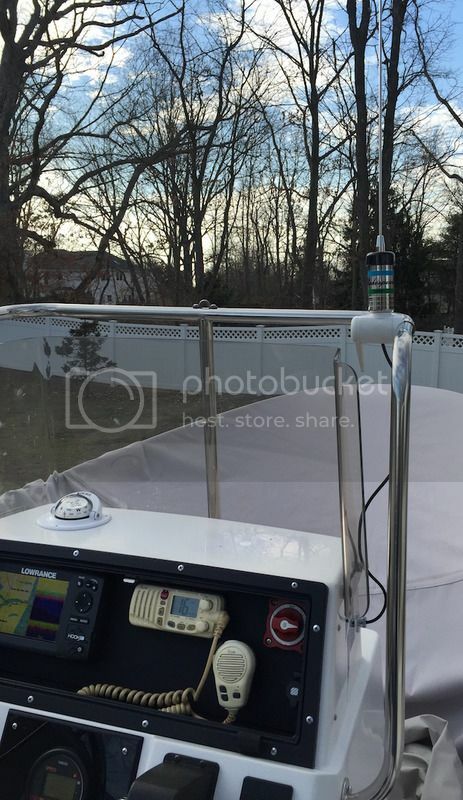 As for a location to mount the base of the antenna for a Boston Whaler MONTAUK 17, as you have already noted, the presence of weather canvas will probably dictate the mounting location. If the Flying Top or other weather canvas at the helm area is likely to interfere with the radio antenna, I'd move the antenna to the stern gunwale. Use a ratchet mount so the antenna can be folded down when the boat is not in use or when angling from the stern is a priority. All fixed-mount VHF Marine Band radios will have a power rating of 25-watts. There is no real option or concern about the power of a fixed mount VHF Marine Band radio. They're all going to be the same power output. Do not become confused about antenna length as being determinant of communication range. From a small boat the most influential element of the radio installation on range of communication is going to be the height of the antenna, not its length. I would (and have) chosen a higher antenna over a longer antenna. Your choices should be fine in Barnegat bay. The radio you picked is a good value. The antenna Jim linked to [the GAM SS-2] is a very nice unit and based on his recommendation I put [a GAM SS-2 antenna] on my 21 Outrage. Do you have a stainless console rail like this? For my 17 Outrage I mounted this antenna on this mount. The mount allows a tool-less drop down of the antenna when I put the console cover on. I had a rear mount 4' VHF on my 15' Whaler. It worked fine for my needs, but it occasionally got in the way mounted back in the stern..
Last edited by porthole on Sat Mar 05, 2016 8:15 pm, edited 4 times in total. Thank you, Jimh. I read through the articles and I do have a few questions that I hope you can answer for me. The Standard Horizon 1300 is at the top of the list for the radio. I do like the SS-2 antenna by GAM as well. I would like to use the antenna by itself, and not use the extension mast. I do not feel that I need such a high antenna on the bay. Therefore, I am leaning towards attaching the antenna onto the console rail. Will I be able to connect the antenna to the transmission line via the ratchet rail mount on the console, or will I need an extension? Which antenna transmission line should I use from GAM? The Plug and Play? http://gamelectronicsinc.com/product/plug-and-play/, or another product? Again, I thank you for your insight and help. I want to be able to order all of the necessary products prior to arriving home in NJ so I can get to work on this project straight away. Thanks, Duane. Yes, my console rail is like that. Nice to know the mount can drop down for the cover. What other pieces of equipment did you need to make that setup work beyond the antenna and the radio? Since I mounted my radio in a console, I used this for a pass through. I'm with Phil; don't skimp on equipment that can save your life. Note the four stainless bolts amd nuts visible on the hull just above the flag. If I was to mount one on that hull again, I'd use mushroom head cap nuts, powder coated the hull color. Beerspitnight wrote: Which antenna transmission line should I use from GAM? Referring to my article about recommended VHF Marine Band radio antennas, please see my recommendation to use the GAM ADAP-II mount. This mount has about 20-feet of transmission line included. This length of transmission line ought to be sufficiently long to enable mounting the antenna almost anywhere on a 17-foot boat if the radio to which it will attach is in the center console. Note that the article concludes with hyperlinks to a retailer who sells the GAM products at excellent prices. Beerspitnight wrote: I do like the SS-2 antenna by GAM as well. I would like to use the antenna by itself, and not use the extension mast. I do not feel that I need such a high antenna on the bay. I recommend using an extension mast. If a four-foot extension is too long for your installation, use a shorter extension mast. The purpose of the mounting the antenna base higher is for most than just increased radio range. 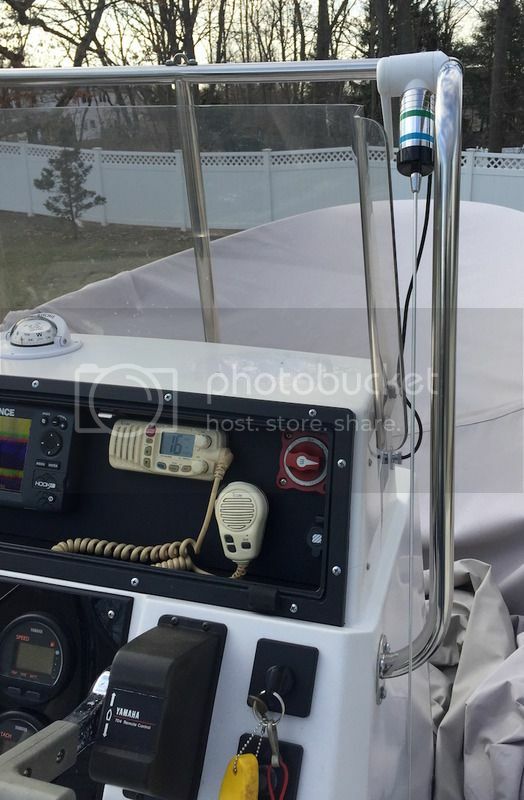 As I explained in my article, raising the antenna several feet above the helm dashboard area helps to prevent RF radiation from the antenna from interfering with other boat electronic devices. A further consideration is for safety. The steel whip of the antenna could be a hazzard, both mechanically--it could poke you in the eye--and electrically--you could get a burn from touching the whip while the radio was transmitting. Although not intended as a hand-hold, people will probably reach for and grab the antenna mounting base for a hand-hold. Using a short extension mast will help to prevent contact with the antenna itself. Also, the extension mast makes a good mast from which to fly a small pennant or flag. Just to review, my preference for the GAM SS-2 antenna and its associated ADAP-II mounting base is due to the very nice manner in which the antenna transmission line can be fed down the inside of the extension mast, as well as the excellent reviews and tests of the antenna's performance. My use of the antenna for ten years has confirmed my initial finding that it was a very good antenna with an excellent mounting base and very clean manner of routing the transmission line. I suggested the nylon lever mount in my post above. I would not use the nylon version if you decide to use an extension. A stainless version (shown in my pictures above) is available and sturdy enough, and doesn't cost that much more. Using the extension pictured on my console, the tip of the antenna would hit the deck folded down. But the whip is very flexible and is a non concern. The Shakespeare 4190 rail-mounting ratchet base looks like a good choice. I have not tried it myself. Compare at DEFENDER.COM's website page where it sells for about $43. Here is another option--and, again, I have not tried these products--that looks like a convenient system for a small boat: the antenna is a Shakespeare QC-3 QuickConnect model (MSRP $40), and the mount is a Shakespeare QCM-SR QuickConnect Rail Mount (MSRP $119). You only need two items for this approach, the antenna and the rail mount, as the rail mount has a built-in connector for the antenna and has 20-feet of transmission line. DEFENDER sells them at a nice discount of $30 for antenna and $66 for mount. The drawback of this approach is that you cannot use an extension mast with these components; the antenna must connect directly to the rail-mount base. I will come up with the part number for the stainless rail mount I pictured above. I chose that version over the other types because of the smooth finish. Personally I think it just looks better, but it is also cover friendly. Thanks again. The setup now make sense. I see why I need the mounting base. I also like the setup by Porthole. I will attempt to recreate it :) I do appreciate all of the help and advice offered here. I've gotten the bug to make the boat as nice as possible, and to kit it out like a champ. I'm sure I'll have more questions as I start working on her. [For installation on a] 1987 Boston Whaler 15-foot center console boat, I picked up a DIGITAL-brand model-528 four-foot antenna. The antenna comes with the [transmission line captivated to the antenna] and includes the male connector that plugs directly into the radio. This makes for a very easy install. I moved the antenna to the front of the console to make more room. It's now much easier to get to front of boat. I tested it from inside my garage [by calling the Coast Guard]; they heard it loud and clear. I'm about 15 miles from the closest water and surrounded by hills. --the base of the antenna is very close to all the electronics on the helm console, and this increases the chances of interference; the transmit signal from the antenna can interfere with the helm electronics; the spurious emissions from the helm electronics can interfere with reception. Based on reading many accounts of problems with VHF radio antennas on boats, it appears that installation of a connector to the antenna transmission line is one of most common points of failures for self-installed antennas among recreational boaters, and it is my speculation that the many very favorable accounts of improvement in performance when changing to an antenna made by Digital are probably due to the pre-installed transmission line connector; it avoids the self-installer from having to install any connector, so they don't screw it up. I use a rail mount on my Sport 15 to hold a Shakespeare extension which has [an antenna with a] stainless steel whip attached. Below my current antenna installation is shown. For the long haul I would probably use the stainless version of this ratchet mount. As shown, I was able to talk to a buddy who was about 7-miles away over land.